attractive price basis. Review by Koyomogi "Ku Liao"
in the old notebook survival Review by IZMY "IZMY"
In order to migrate to OS 7 XP, or because it was in Kokoromotonaka~tsu 2GB was attached from the original, and I purchased it for expansion of NEC VY16A/W-4. So 64bit OS, you can use the full 4GB is, and has me running crisp so far. Because it is the machine that I like very well, I was able to prolong life for a while now. It is a purchase in order to increase the amount of memory on the PC you are using now. I added one by one to two. Test, there is no problem at all in the first MemTest86. Remove the (0.5x2) original 1G, I changed to (1.0x2) 2G of this time. Operation had been unrefined anyway Windows Visat, but I now work fairly lightly. However, I had never ever fell in the blue screen, but even once, Windows fell twice blue screen. It is not clear memory may or may not cause, but it is moving without any problems otherwise. I can say speaking from this price, cospa quite high. One in two do not move at all, I have determined that the initial failure. I contact the shop, but it was not possible exchange hesitation in dealing with Japanese to understand you have used the translation site. In addition, we also purchased Desktop Memory from the same manufacturer, but it was broken immediately. To 4GB XP, from 1GB. When the 1GB, movement was painful is pretty, but I got better. You have to Vista then, I feel movement is lighter than in XP (but is on the elimination unnecessary movement) is. I think that I bought on spec because it was cheap, but because it moves me without any problem, that it was good. I we use in macbook. I arrived as soon as you order. recognized by ASUS W3000 Review by Ryo-chan ? It is a notebook PC old 2006 made ? ?BY ASUS. I was thinking the scrap With the XP end, but I was looking for a memory because it starts in Windows7 32bit. It was a single-core CeleronM370 1.5GHz, but I bought it knowing this memory manufacturer in heavy gauge memory 1GB. I thought it whether it is boyhood in compatibility problem, but to recognize safely, and it was with no movement stress is a bit heavy to move. And we plan to use as a sub-machine ASUS W3000. Do not use as a music player and DVD viewing. Very effective in fulfilling the order. The order was as expected. Very grateful for replacing memory. Memory is 4GB and it seems to work. The computer detects it, but when you're working, at 5 minutes is all locked. Just 2 days after I wrote a nice feedback of this product, my 2008 iMac did not runs, only continuous beep sounds and the computer did not start OS X. Then I put the original RAM and all the was perfect again. I am running without any problems. In order to noon on the 29th (Thursday), goods arrived at noon of Saturday 31. 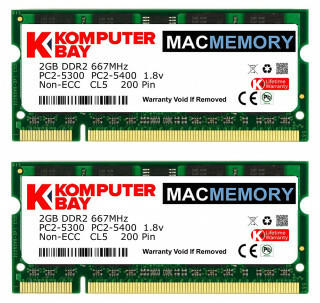 Buy for memory expansion of the terminal of the iMac (Mid 2007) Review by 00 "00"
I purchased for memory expansion of the terminal of the iMac (Mid 2007) mountain lion. It is a retrofit to 4GB from 2GB. I was worried a little because it was the manufacturer who does not know and a little cheap, but I can be expanded to 4GB easily and safely. You can now move comfortably win7 you have put in bootcamp. The mounting of the VAIO Core2, the Vista notebook. can now be used in pretty decent after replacement. I arrived on time. So far I have not had any problems with them and that I have a MacBook Pro aluminum early 2008. ... They fit into the corresponding slots. Installed and commissioned in accordance with the provisions of the maintenance manuals. Incredible change gave him an old laptop!. For a relatively affordable amount I could upgrade to Windows 7 and goes fast. I am very pleased with this order, I have fulfilled my expectations. has been delivered in a timely manner and the product meets advertised. I needed a very specific memory to increase it had in the iMac. Want to improve the power of your computer? A couple of days I installed these modules and now run smoothly on my Aspire 5630, which came standard with only 2 GB, now expanded to 4 GB ago. The downside is that it only allows you to use 3 GB even on a 64 bit system - recognizes 4GB but only 3GB is usable. It seems that the jig is appropriated another graphics card, or so says Acer, but I see not very clear because when he was 2 GB, said nothing about it in the system properties, which now does occur. It's what I expected, they simply have allowed me to extend the life of the PC. Beware the specifications of the motherboard Review by Manuel Celis Garcia "Entropic"
MacMemory, Review by Stephen Y. Worked perfectly, Review by Joe Davis "jbdavis17"
Affordable Memory thats works and meets Apple specs Review by A. BLITZ "Macs Only for me"
The best compliment you can give a computer component is that it just works. 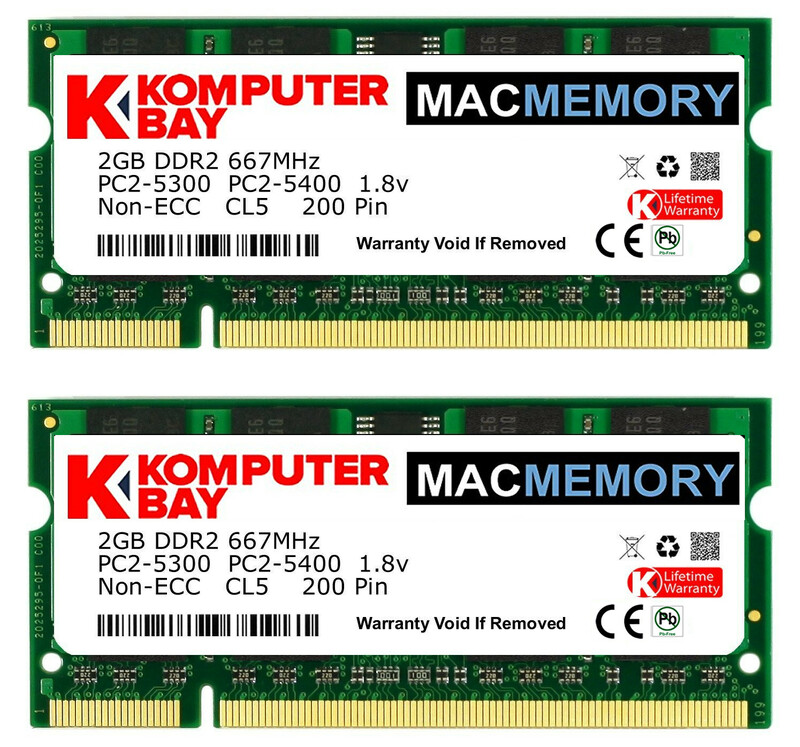 Bought for my wife's white MacBook (circa early 2008 I believe) which had 1GB of RAM. Perhaps that was enough in 2008 but several versions of OS X later and it was sluggish. Upgrading to 4GB was just what it needed. The memory from Komputerbay arrived quickly, installed without issues and I noticed the difference in speed immediately as it booted much faster. The new memory I purchased for my Vintage Desktop iMac was just what I needed! I was somewhat unfamiliar with how to install the memory in the Mac but ended up getting assistance from the Genius Bar at Apple! I simply didn't push it in far enough for full contact. But it is working just great! Thanks for the quick delivery and exceptional product. One suggestion, you may want to add a simple illustration or narrative about installing the memory into the slots of computers that use the memory cards.